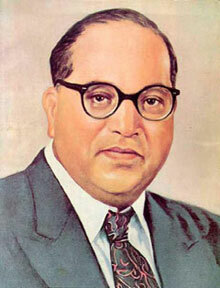 Mumbai, India -- Babasaheb Ambedkar smiled again after 50 years. On Sunday, May 27, close to 100,000 members of the Dalit community and 41 other tribes gathered at the Mahalaxmi Racecourse to turn their backs on an oppressive life and let a sense of freedom wash over them. 'Early Sunday morning, jeeps, vans and trucks drove into the racecourse grounds where the people in the vehicles began to alight. Hundreds soon swelled into thousands and thousands swelled into tens of thousands. The number eventually touched the 100,000 figure. They came with their families, families of tens and thirteens. They came on their own, lone figures chanting Buddhist mantras under their breaths, but not alone in their quest. Those about to embark on a new journey altogether were accompanied by those who had already gone down that path, the former dressed in their burnt saffron robes and the latter, in pure white. 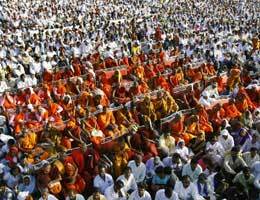 A hundred and fifty monks were present to give their blessings to the new devotees. Cutting a striking picture in their orange robes, they filed up to the stage in a silent line, where they were joined by the eminent Buddhist leader Rahul Bodhi. Besides the Dalit community, 41 other groups were present, traditionally belonging to the government OBC classification. The process of conversion began at five in the afternoon, when everyone was seated on the grounds. Once one has made the shift of loyalty to this faith, the process itself is simple: taking an oath of allegiance. The crowd chanted Buddhist mantras after Rahul Bodhi and then took their vow. The vow is simple and straight-forward: renouncing Hinduism and preaching only the five principles of Buddhism. The weathered faces of the tribals and the Dalits looked up at their new guide, Rahul Bodhi, as he spoke, trembling hands holding onto posters of Babasaheb Ambedkar came together in prayer and eyes radiated hope, unblinking and strong. Sangeeta Anil Dandekar came with 13 members of her family from Bhandar zilla. Reality as a Dalit or an OBC caste is harsh and unforgiving. Babasaheb Ambedkar knew what he was talking about when he had urged his community members to shift to a less prejudiced faith. Thousands of them walked down that path on Sunday afternoon in what can be said to be India�s biggest mass conversion. This is symbolic of changing times, especially with Mayawati�s win in UP. There is a saying that every man deserves his �15 minutes of fame�. Perhaps the time for the Dalits and OBCs has dawned.